Bare roots are best planted before they start to leaf out. In warmer regions plant in late fall through winter. A bare root plant is simply a plant that is sold with its roots exposed rather than in soil. They may look like a bunch of sticks, but will grow into a wonderful tree that will bear you lots of fruit if properly maintained. 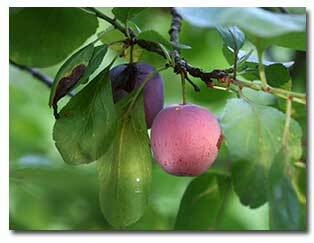 Deciduous or dormant fruit trees available bare root include apple, apricot, cherry, fig, nectarine, peach, pear, persimmon, plum, pomegranate and prune. Nut trees such as almond walnut are also options. You can also find bare root berries, grapes and other vines as well. Prune off any damaged or broken roots, and plunge the remaining roots into a bucket of water to soak while you dig a hole. Dig a planting hole and check the drainage. If the soil is heavy clay, work at least 2 pints of amendment into the soil in the bottom of the hole. It will do no harm, and it may improve drainage. Backfill the hole by sifting the native soil you took from it back into the hold–around, through and over the roots. (Do not add soil amendment unless you’re planting in pure sand.) Plant high, so that as the tree grows the area where the trunk meets the ground is high and dry. Press down with your hands to compact soil around and over the roots. Make a watering basin. Mulch the ground around the plant and in the basin. If the tree does not already have a good branching habit, prune it immediately after planting; cut the tree to a height of 30 inches to 36 inches above ground. Remove most of the side branches (if there are side branches) except those needed for main scaffold limbs. You can produce a low branching tree by choosing to keep three low branches that are not exactly opposite each other. To protect the trunk from sunburn, paint it with flat white latex paint (not enamel) that you’ve slightly diluted with water. Water deeply by allowing the hose to lie on the ground and trickle into the hole until it penetrates around the roots. In fast draining sandy or decomposed granite soil, water often until the tree is established. If drainage is poor or if the soil is heavy clay, check once a week and water when the soil begins to dry out. Gradually lengthen the intervals between irrigations. Enjoy your new fruit tree!